Abies ziyuanensis, first described in 1980 by Fu Li-Kuo and Mo Sin-Li, is commonly known as Zhiyuan fir, or 资源冷杉 (Zhiyuan lengshan) in the Chinese language. Description. Zhiyuan fir is an evergreen coniferous species of tree that will grow to mature heights of 100 feet (30 m) tall with a 36 inch (90 cm) wide trunk at breast height, with a straight round trunk and long, horizontally spreading branches. Bark is smooth and gray on young trees, becoming pale gray, irregularly scaly, ridged and grooved with age. Branchlets are stout, initially light yellow or brown-yellow, sometimes turning gray-black by the 3rd or 4th year, with ridged and grooved surfaces. They are glabrous or with short hairs in grooves and circular leaf scars. Vegetative buds are ovoid to conical, covered with a coat of white resin. The bud scales are triangular and light yellow-brown in color. Leaves spirally arranged, ascending on upper side of main branchlets, pectinately arranged in 2 lateral sets on the lower side and on lateral branchlets, 0.4 to 1.6 inches (1 - 4.2 cm) long and 0.1 to 0.14 inch (2.5 - 3.5 mm) wide with, stomatal lines in 2 white bands on the lower surface. 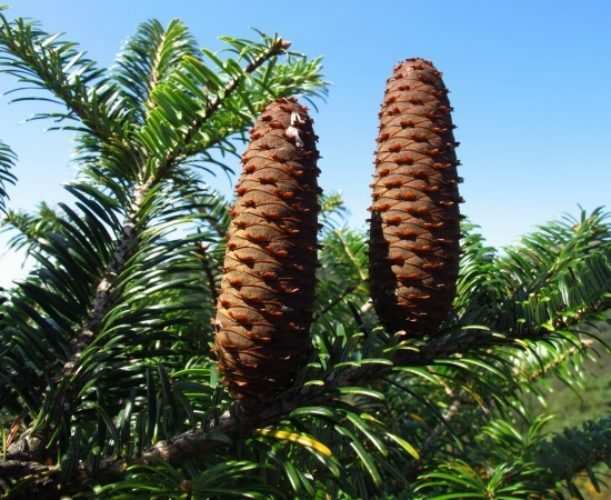 Seed cones are borne on 0.2 to 0.4 inch (5 - 10 mm) long peduncles, green or yellow-green in color when young, later maturing dark green-brown, then dark brown at maturity. They are cylindric-ellipsoid in shape, 2.8 to 4.8 inches (7 - 12 cm) long and 1.4 to 1.8 inches (3.5 - 4.5 cm) broad with persistent axils . Seeds are purple-gray, obtriangular, ca. 0.4 inch (10 mm) long, including a spotted, shiny, broadly dolabriform wing. Pollination takes place in May with seed maturing October through November. Distribution. This species is native to China — northeastern Guangxi (Ziyuan Xian), southern Hunan (Chengbu Miaozu Zizhixian, Ling Xian, Xinning Xian), and western Jiangxi (Jinggang Shan) provinces, growing in the hill country at elevations of 4,500 to 5,800 feet (1,400 - 1,800 m) above sea level. Unlike other Abies species that are distributed in areas with cold climates, A. ziyuanensis is restricted to several isolated island-like localities in subtropical mountains. Hardiness data is unknown at this time. Zhiyuan fir's native mountains have a cool, very wet climate, with a mean annual temperature between 48.5° to 53.6°F (9.2º – 12ºC), and a winter period of four to five months (November to March) in which the mean temperature is between 26.6° to 23°F (-3º to -5ºC) (min. -10º). The weather is usually cloudy, with much fog, the annual precipitation is 82.7 to 94.5 inches (2,100 – 2,400 mm) per year and snow lasts from December through March. Abies ziyuanensis — foliage and mature seed cones. 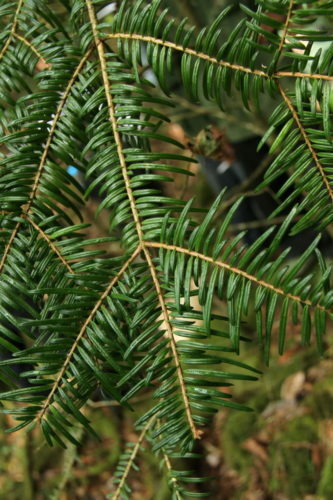 Abies ziyuanensis — foliage detail.